There is a difference between content and blogging. Blogging is a lose collection of posts that don’t support an overall goal. There’s no architecture. There’s no plan. A post is taken from ideation to publishing before the next post is considered. Content is a cohesive strategy that supports a particular goal. It’s organized as a whole, or at least in large chunks. Content marketers typically create an editorial calendar that arranges topics and promotions according to the overall content strategy. But this document rarely organizes the relationships between pieces of content. It’s tough to build an audience around standalone content unless you’re publishing a lot of content quickly. Content monsters like INC, Forbes, and Mashable post dozens of times every day. Competing at that pace isn’t feasible for most people, so you have to compete on value. You can add gravity to your content by organizing your posts according to the hub and spokes structure. The hub is a comprehensive piece of content that covers a broad subject. It should target a short-tail keyword. Don’t worry about the competition of this word. Find one with as much volume as possible. Write a bit of introductory content for this page, but stay brief. Then create a list of all sub-topics that relate to the main topic. The page should look like a table of contents, where each sub-topic is a link that takes the visitor to a page that explores that sub-topic. The hub will function as a landing page. (It’s not a true landing page, but you get the idea – people arrive on it). It’s designed to be discovered and pass traffic to the spokes. Visitors will arrive on the hub, flow to the sub-topics, and click your calls to action. Your spokes will be internal and external sources that dive deeper into the sub-topics listed on the hub page. For example, if your hub page were designed to teach someone how to fly fish, you would link to sources on how to dress, using the right type of boat, and how to cast. I recommend creating no less than 12 spokes. 4 links to internal (on your site) sources. 4 links to external (off your site) sources. My favorite example is Help Scout’s Customer Acquisition Strategies for Entrepreneurs. As you can see, they have more than 100 links on that page. Comprehensive! Some traffic will arrive on your internal spoke pages. Link back to the hub from the spokes to send traffic that way as well. Use a mix of short- and long-tail keywords as anchor text. If you haven’t created the right pieces of content yet, don’t worry. Link to external sources for now, publish the hub page, and edit the page with links to your own content over time. Add the spoke topics to your editorial calendar. Don’t worry about giving traffic away to other websites. If another brand has written or created something truly valuable, give it to your fans freely (although it couldn’t hurt to let that other brand know – maybe they’ll throw some good will back your way). Your spoke pages must be comprehensive and bookmark-able. Don’t leave anything out. The goal is to entice users to return to the page frequently and share it with their friends. (Plus, the structure lends itself to sweet SEO equity). Analytically, you will notice a few interesting things about the hub page. Time spent on the hub page will be low, because it’s only a reference page. Unique traffic to the hub page will be greater than other pages on your site. Bounce rate on the hub page will be low because the whole purpose is to send the visitor to another page. You’ll capture more email sign ups on spoke pages because you’ve given the reader an impressive level of value and built more emotional investment. The beauty of this strategy is that it creates an understandable architecture to your content. Visitors explore more pages because your content is efficient as a whole. It feels more valuable than a collection of isolated island blog posts. Once you finish a hub and spoke set, you can move on to another without losing track of what you’ve already created. This makes interlinking far easier. Choose another short-tail keyword and create a new hub and spokes around another topic. Link generously between spoke articles and hubs wherever appropriate. You should spend as much time distributing and promoting your content as it took to create. 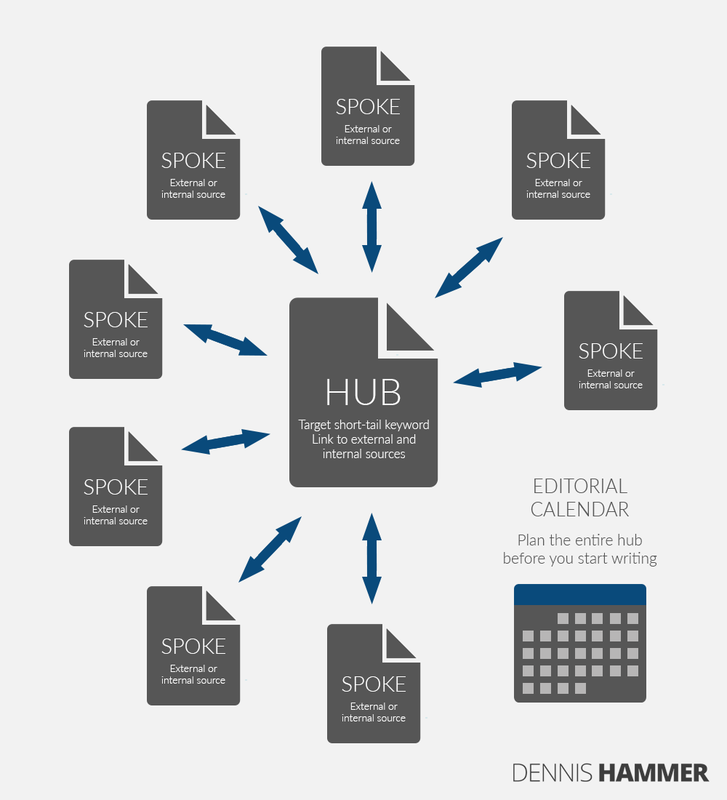 Since your hub and spoke took more time and energy than a standalone blog post, you should spend more time promoting it. Naturally, post on social media (multiple times) and announce the new content to your email list. You should also find influential people with similar audiences and email them about your content. Be personal and pleasant. Don’t use robotic-sounding email templates. Content creators often resist publishing articles that are similar to previous articles. There’s a bit of narcissism in all of us that assumes our readers are dutifully reading our posts as we publish. Truthfully, few people will experience your content sequentially. Most will drop into a post from a link or a Google search and explore from there. If you’re at the beginning of your content journey, this is even less of an issue. So don’t worry about writing consecutive posts on the same topic. If you need two spoke articles for your hub, get them finished.